Q. What does HQ expect from Felix in 2018? A. They've got him for 11-8, 3.91 with 8.1 strikeouts and 2.9 walks. I'll take it, bro. The 160 innings they glibly schedule, that's a hedge. He's as likely as the next guy to give you 27-30 starts. On the one hand, he's got high mileage. On the other, he recruits his big muscles and decelerates perfectly. I'll take it. In their draft guide they've got him in the group #46-95, which group also includes Lance McCullers, Sonny Gray, Alex Cobb, and Johnny Cueto. They're factoring in REL(iability) and everything else. On BJOL's starting pitcher rankings he has fallen to #60 overall, by definition a 2-3 SP if you cut the group up among 30 ballclubs. Q. Is Felix as good as he was in 2014, when he was worth $46M with a 2.14 ERA? A. We will assume that ==below this line== the Denizens have oriented themselves. We are not asking, is Felix a superstar. He is not. "King Felix (TM)" is past tense. It's time to ask different questions about the man. We are asking, is Felix better than Ariel Miranda and Marco Gonales, and if so, BY HOW MUCH is he better. ...than a fringe pitcher. The spoiler answer to that is: Felix is (in the 'Frame's crunch, anyway) worth plenty more than a fringe pitcher. Plenty with a capital P. Fangraphs had him for only $3M worth of bases last year and $8M the year before that, but I'd give you 4 x $13M for him right now, or 3 x $15. All day long. Q. Speaking of which, how much dinero are the M's shedding on its Felix deal? Does his contract, in retrospect, argue against MegaDeals? A. It does not, no. Felix gave the M's a shade the better of a hometown contract in 2013 when he signed for 7 x $25M, importantly including a clause in which the M's got a free year off an elbow injury. He earned $42.3M in the first year of that deal, $46.4M the year after, and $23.1M in 2015. He has thus earned $131.1M in the first five years of the $175M deal, with two years of pay-to-play remaining. It says here that he will finish at around $175M in performance delivered, but let's say he finishes at $152M. That's an argument that a $175M bet was irrational? Of course it isn't. Anti-megadeal talking heads will clutch their pearls and point to ANY underperformance, let's say a 92% of contract delivered performance, as a Greek Tragedy. Dr. D absolutely will not. Felix is a Mt. 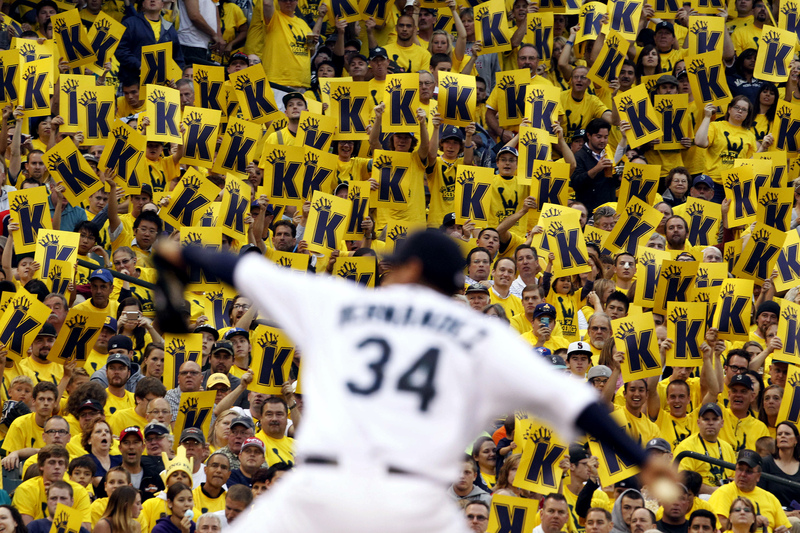 Rushmore icon in Seattle, with a yellow-card King's Court section unlike any other in sports, and we'll tell you something else. We estimate with a 60%, 70% coefficient of confidence that Felix will perform well in 2018-19, significantly better than he did in 2016 and especially than he did in 2017. Not to the tune of a 2.14 ERA, of course, but to then point where he flips out quality starts with regularity, enough regularity to get Denizens smiling at Happy Felix Day again. Q. Based on what FACTS, cadet? A. True, his fastball has been quite minus lately. But he's got a very plus curve ball; with that curve alone he's a major league pitcher. His slider had a +2.15 run value to it last year. His dry spitter got mush enough last year to drop from the +2 area to the =0.00 type area (it was actually -0.36 but Dr. D puts that down to randomness). You are talking about a pitcher with 8+ strikeouts and 2+ walks, a combination true of only 8 pitchers in the American League. Is 'cause that's how good Felix' bendy pitches really are. That's the fact. Felix has three separate tough secondary pitches and his biggest problem in 2017 really was missing over the plate, mushy COMMAND as opposed to lack of stuff. It sez here that with no WBC and with a series of 168 and then 86 IP seasons, we could very easily see plenty of "crispness" return to his overall command of the ball. But even if it doesn't, you're looking at his giving you 1-2 WAR -- plus what he gives the Seattle Mariners Brand. There are a whale of a lot of guys who won't give you any of that stuff. A. We don't quote HQ directly very often; here's their summary on Felix. Buy their book at this location. Dr's Prognosis: Felix isn't going to win any more Cy Youngs, that is for blinkin' sure. But the next two years give you a real shot at a moderately TOR pitcher and, with that offspeed set, a bankable average-solid SP. SP over the last few years when he was still on the FA board. He's handled his aging significantly more smoothly, statistically speaking, than Felix has--but Felix, to my mind, would have been a better BET to age gracefully precisely because of how dynamic his arsenal is, and has always been. Those bendy pitches of his have always given opposing hitters fits. Back when he was in the mid-minors, his curve ball was what everyone raved about. Then when he hit the upper minors, it was his slider (which they infamously refused to let him throw for fear of hurting his elbow) that everyone pointed to as his Key To Success. Then he pulled that 'changeup' out of his hip pocket, Pedro Martinez style, and leaned on it en route to the Cy Young and a perfect game. (edit to add: and I totally forgot about his INSANE swerveball, the one that Manny Ramirez and David Ortiz wryly observed that if he could throw that pitch every game, he'd never lose again, or some such). The point here is simple: this isn't a guy who had two ML-quality pitches in his teens and has been slowly, methodically, and predictably morphing his approach as those pitches age along with his arm. He's a guy who, early in his career, seemed capable of essentially inventing 70+ grade pitches on the fly and then deploying them at will. That's the kind of guy who I would bet on having a smooth late career performance arc. Alas, it has not yet been thus, but I'm looking forward to his performance in the upcoming season. For the last few years and the performances have continued to drop. Because of those pitches we've seen I can't confidently say that he won't compete for another Cy, but because of the decline I couldn't say he won't be a Silva like boat anchor. He's the guy I wouldn't bet on any outcome from. I think it is the hardest thing to determine going into next year. Paxton in my mind is 1 of a select few pitchers that could be CY worthy next year. 2016 was the year of 2/3 super bad luck stats that masked the fact that he was the AL Fip king. 2017 depending on your perferred WAR dealer you have a high 3's to mid 4's WAR guy in 2/3rds a season. So back to that Fip thing in 2016 he had a great 2.8 Fip in 2017 it went down to 2.61. Pax has a very nice 3.28 career ERA good for a 122 ERA+ but that Fip is down @ 3.09 for his 74 starts. I would be very shocked if he was not below 3 ERA next year and I am thinking we have a top 10 in the AL CY next few years. Felix, I push that he is our #2 and that 60 rank is about right. I have looked at the Change up as being elite, The Curve has also had those ranks, slider as well. Felix has lost a bit on the FB every year. I believe FG had his best effort @ 92.9 last year. With a little pixie dust and positive attitude I could see Felix with a 2015 performance 30 starts a 105 to 115 ERA+. Felix had a 201 IP 4.4 BWAR and not the same season but something more like 30 starts for 180 innings less staff work-horse Ace mentality and little better strategy utilizing BP. We have seen plenty of CY contenders get there without a Paxton FB. Rich Hill has many off-speed weapons and his career peak velocity was 95.5 a LHP I know but that does not take away from the locate FB and have several + or ++ other stuff and you will have a winning formula despite not throwing the lights out of radar guns. Leake, He is a reliable so-so pitcher I know the 170 ERA+ has M's fans a little "up" on his skills but he has 15 WAR in 8 seasons and a dependable 2 WAR 100 ERA+ guy has some value. His peake year was 3 WAR. If I am just over the moon with positive assessments sure he improves on it but 2 WAR +/- .5 would be my realistic value. Erasmo, I know the cut FB and plateu leap and all but his range is wonky he has a 93 ERA+ with significant time as a BP arm and as a BP arm never really dominated this is a bit alarming. Best season was 34 games 27 starts 163 IP and 2.1 WAR. I think he could/should put up 1.5 or 2 WAR as he is currently built. #5 Kuma, He had light use last year has never had an ERA+ below 98. He is in no way the 7 WAR # 3 in CY from 2013. Could we see the return on of 2.4 WAR, 2.6 WAR, 2.5 WAR that we saw from 2014 to 2016? Sure. Marco, He was a top 100 prospect . I don't like him. I hate the trade and always have but he was once a minors gem with a weapon, and make-up. Miranda has stuff: WOW a -76 WRC on Slider highlights his stuff ( only his 4th highest used pitch) backed by a splitter which is #2 most used pitch creates a 51 WRC. That is 2 weapons that have obvious succesful outcomes. The other 2 pitches he has get bombed on his peak of 97.5 MPH FB and change-up. The FB has yielded a 153 WRC with a positive trend but still as the most used pitch? The change went from an acceptable 106 WRC to a 171 WRC in 2017. Rich Hill runs in to him playing golf and teaches him his two curves and wammo CY contention. He has two legit weapon pitches. He has moxey any improvemeny could be huge, FB location, a curve ball taking away % of FB, some combo. For my Velocity and WRC values for pitches I use Fangraphs (splits/ pitch type splits/ all) You get min-max and ave velo and then the wrc values given up by pitch type. I get how given a shot of optimism and the reality that our line-up is so improved over like 10 years ago, the BP seems to be solidly above average, and you do have a legit Ace and the eight I bothered to list. Given that Paxton has a put it all together year. Felix has a rubber arm year. and then you have a cobblestone of 2 to 3 WAR 2is to 3ish types behind them. I can squint my eyes and see Jerry's comments. Leake's pitches. In several ways he's similar to what we'd like to see from Felix. I pointed out recently that Leake has had 2 or 3 positive value pitches every year, same was true for Felix until 2017 (1). Leake at 2.5 WAR sounds about right to me. But I'm possibly the highest on him. I'm not sure when to expect Kuma if he ever can return to any semblance of form. Yours is the first expectation of anything at all that I've read. I don't think Dipoto even lists him when discussing rotation depth. Maybe he does. I understand you're squinting to try to see what Dipoto does. Ariel and Marco have fastballs that are negative. That keeps me from having much faith in their overall possibilities. I like Miranda more of the 2. Speaking of Moore, you missed him entirely. Where do you peg him. He'd be my #5 today but I think he can work on pitches in AAA if someone its acquired. His arm is hurting...he can learn all the new pitches he wants but if he has lost the fine touch in his fingers because his whole arm feels like that feeling you get when you bang your funny bone and yet heavy and numb at the same time...he's not going to do well. Doc is spot on...if healthy, Felix returns to solid #2 status and it's not hard. If not healthy, he is what he's been the last two years...a #4 that you have to baby along. It is what it is.